Angus McDuff the Skilky Terrier at 6 years old—"I adopted Angus from the Humane Society of Sarasota County. His name was "Chester" and his owner said he was 2 years old and was a "fine young Scottish Terrier." However, he had been surrendered for "not coming when he was called" so I changed his name to Angus McDuff in hopes of him responding to a more manly, Scottish name. It soon became apparent that not only was he NOT 2 years old but most certainly a puppy, he was obviously not a purebred Scottie either, and recent DNA testing revealed the truth: he is a Silky Terrier and Scottish Terrier mix—a Skilky Terrier! He has a beautiful soft gray and apricot brindle coat and is full of energy. While he isn't interested in hunting lizards or squirrels, he does love soft toys, running, swimming, stealing food and socks, and playing games. His two favorites are acting like a pirate—he jumps back and forth saying "arrrr," and playing peek-a-boo—he hides around a corner and jumps out with a loud "grrrr" when any of the pets come by! Angus is prone to barking at any sound, especially doorbells and ringing noises on TV, dislikes music or video on the computer and tends to be a nervous dog. He has been trained to basic commands, but needs medication to handle any stressful situations like grooming or vet appointments. He prefers to stay indoors and be walked on a leash, even in his own backyard. When he is calm, he is a delightful, loving boy but if he gets wound up, watch out!" The Skilky Terrier is not a purebred dog. 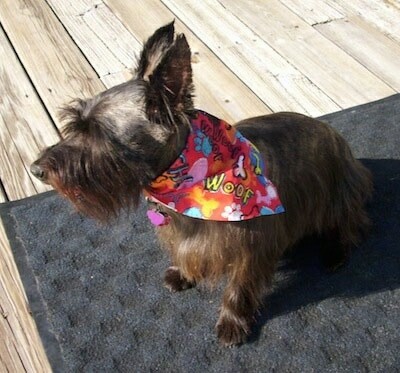 It is a cross between the Scottie and the Silky Terrier. The best way to determine the temperament of a mixed breed is to look up all breeds in the cross and know you can get any combination of any of the characteristics found in either breed. Not all of these designer hybrid dogs being bred are 50% purebred to 50% purebred. It is very common for breeders to breed multi-generation crosses.